So here we goooo, meme time! 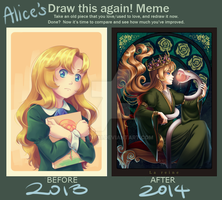 The point of this meme is to take an old picture you really loved at the time, and redraw it now to see your improvement. The template originally only had slots for "before and after", so i had to modify it have three slots ._. I drew Joel on July 2, 2013 shortly after I beat The Last of Us. Being a big fan of the game, my brother eventually saw the drawing and requested one for himself as well, so I ended up having to draw Joel again shortly after on October 26, 2013. When I completed the first Joel drawing, I was pretty ecstatic. I had only just started to do realism portraits and I thought it was amazing. Then my brother comes along and I redraw it, only to feel it was EVEN BETTER. I remember feeling on top of the world when I gave it to him as a gift, I was so proud to have it being displayed on his wall. But now? Yesterday I redrew Joel, and I almost cringe thinking about the one that's displayed in his room lol. It doesn't matter how good you think you've become. You're always going to get better. Honestly, just like back in 2013, I feel like this 2015 is the best I'm gonna get. But who knows. Maybe in 3 years I'll draw him again and look back and cringe at the 2015 one too. As long as you put the time and effort into learning and practicing, you'll keep getting better. I've been drawing for like, 12 years now or something. Skill doesn't come quickly, but you WILL get better. "Don't let your dreams be dreams". That's awesome! I love the details and the contrast ! But how did you get 3 slots, since I've only seen this meme with two slots xD. Thanks, I've always loved strong contrast so I've focused on improving that =]. I literally just made the meme bigger myself lol. I increased the canvas size in photoshop and just made room for another picture. I just sized the pictures in there the way I needed to. Hope that helps. The way you've improved is unlike any I've seen. You were fantastic in 2013 and yet your contrasts and highlights and allignment has come together to present a very deep portrait. But not just this but the details have become richer, the thing I'm most impressed with is the sharpness, and even the clothing. This takes practice and I'm sure you've learnt new techniques to get to where you are now or just know better how to use your tools of the trade (the pencil). Wow, you're too kind xD. Thank you. I've definitely learned a lot as I've gone. I started out drawing anime/manga type stuff for years and years. When I eventually moved onto portraits, one of the biggest things I learned was that I wasn't going to complete these at the same pace as the anime drawings. The first picture here from 2013, I was still attempting to do the portraits within 1 sitting, in anywhere from 2-8 hours, much like I always did with the cartoons and stuff. Realized that I wasn't going to be able to achieve the detail I wanted in that small amount of time, and I started spending longer on each one(not to say it's not possible, there's definitely some extremely skilled people out there that can do masterful stuff in no time at all, but I wasn't anywhere near that level xD). It probably takes me anywhere from 20-50 hours on average now I'd say. Aside from that there were still several other things I learned though, from tools to techniques. Size and type of paper are both extremely important, I prefer mechanical pencil over standard, eraser sticks and kneaded erasers are irreplaceable to me, and general tips and tricks along the way just kinda made themselves known through trial and error. It's a shame you feel that way about your graphite portraits. You definitely shouldn't give up =]. In my personal experience, I found myself halting progress constantly as well, even felt like I was getting worse here and there too. I found that unless I opened myself to some form of change, I wouldn't move forward. Every time I try something new, I feel like I gain a little bit more understanding. Whether I tried new tools, spending more time on each drawing or even just researching different shading techniques, that's when I felt like I did a bit better. On top of that, there's definitely a lot about shading with graphite that just eventually kinda "clicks". Until then it can be really aggravating ._. A lot of the time though, progression could be just around the corner by learning to use a new tool or something. If you have any interest at all, I did a little tutorial thing where I went over the tools I use and a bit of the technique I follow. Realism Portrait Tips/Tutorial *BIG FILE* It's a little dated now, but most of it is still generally the same =]. Thank you kindly ^_^. Hopefully I'll do another some day and it'll be even better =]. how much time did it take to draw each? Definitely took more time each time I redrew it. The last one probably took around 20-30 hours. Oh yeah? I feel like it should be the other way around. The more times you draw something, I'd imagine you would be faster just cuz in theory you should know what to look for and stuff. I should try redrawing something I've drawn a long time ago. Wow *o* awesome evolution ! I love how it shows the great importance of contrast and dark dark dark shadows !! Thanks xD. I almost feel like doing it again sometime soon, it's nice to see how my stuff changes over the years. Next he will blink the eye. Graphics updated haha... Anyway that's a great progress, thank you for posting. *Plus you are giving us hope! Dang, must be so cool to see yourself improve like that. Awesome stuff man. 2, a bit better the n the last, i see the contrast is a bit more defined. 3, Nice grayscale picture! Very nice angle and... wait.. this was made with pencil? Lol xD. That'd be quite the improvement for 28 days xD. There's definitely some improvement here! Well done! I think these are all awesome, but even so one can see your artistic progress. Wow, you can really see the improvement, nice! You were already pretty good in 2013 but wow, 2 years of practice has done wonders to your art! Your newest version looks like a black and white photograph! Your shading is impressive. Woooow! Great improvement! It's sooo motivating and inspiring!